Veneered in ivory, walnut and maple on a carcase of walnut, oak and maple; set with panels in gilded copper, painted with scenes from Ovid's 'Metamorphoses'. By about 1600, Augsburg in Germany was already the centre of the production of cabinets, mostly in ebony and, more rarely, in ivory, mounted with silver or gilt brass, enamel and semi-precious stones. Because these cabinets were made from precious materials and assembled with such skill, they were regarded as fit for princes and noblemen and served as diplomatic gifts. Sometimes they were supplied already fitted with a variety of small, rare, collectable objects. Some were from the natural world, such as coral or shells, and others were 'artificial' or examples of human skill, such as watches or pieces of fine ivory turning. Ulrich Baumgartner and his son, Melchior (1621-1686) were amongst the most skilled makers of such cabinets and they are known to have made cabinets very similar to this one. The small panels of gilt copper which decorate the interior of the cabinet are painted with scenes taken from the edition of Ovid's 'Metamorphoses', published in Frankfurt in 1563 with engraved illustrations by Virgil Solis. A small table cabinet, veneered in ivory, walnut and maple on a carcase of walnut, oak and maple, the inside of the doors, the central cupboard and the bank of drawers set with gilt-copper panels painted with scenes from Ovid's 'Metamorphoses' and with round discs of carnelian. Key. Cabinet of walnut veneered with ivory, resting on brackets decorated with acanthus scrolls (possibly a later addition) and terminating in ivory bun feet at the front. All three sections of the cabinet are decorated at the top with a fillet of walnut cut in a fringe pattern and applied to the ivory veneer. The projecting base is fitted with a drawer, the doors and side-panels of the main body are decorated with ripple moulding, and the upper part has a flat hinged top. All three sections are fitted with locks, the front with a gilt metal external bolt and the side panels with gilt metal handles. The back of the middle section is veneered with a four-pointed star-pattern of tulip-wood on a ground of stained pine, framed by a rosewood veneer. The top and the bottom sections of the cabinet are each veneered at the back with strips of walnut, arranged with different graining patterns, into a rectangular frame. The doors open onto what seem to be ten small drawers each decorated with a painted gilt copper plaque, but are in fact eight small ones and one longer one at the bottom fitted with two plaques. They are painted with scenes from the Metamorphoses of Ovid, which centre on a cupboard, in the form of a double pedimented aedicule flanked by walnut columns. The inside of the doors of the cabinet are decorated with discs of carnelian in the corners and frames in the form of triumphal arches, topped and flanked with acanthus on all four sides. The drawers are made of oak, and the plaques are recessed into the fronts of the drawers, and retained by the ivory veneers on the drawer fronts. The cabinet is raised on low, bracket feet, above flat, turned ones inlaid with a line of ebony. The two back feet are wooden and quatrefoil in form (probably replaced). The base is set with a single, full-width drawer. Above this are two doors, with flat, mitred outer frames of ivory, separated by narrow bands of ripple-moulded ivory from a central flat panel. The doors open to reveal a bank of 10 drawers (one concealed in the pediment of the central door) surrounding a central cupboard door flanked by columns veneered in turtle-shell, with gilt-brass bases and capitals, surmounted by turned ivory vases. The columns are outset from the central cupboard, raised on tall, narrow plinths, the fronts set with panels of painted gilt-copper. Ripple moulding runs below and above the columns, across both door and columns, outset above these. The drawers are veneered with horizontally set ivory, outlined with a framing of ripple-moulded ivory and are each set with a single, oval gilt-copper painted panel, surrounded by 4 circular discs of carnelian, and with a single gilt-brass knob set at the bottom of the drawer front. The doorcase and the gilt-copper panels on the inside of each outer door are set with low relief framing in carved ivory. The central cupboard of the cabinet contains a removeable dovetailed oak box (ebonised on its front edges) which probably held a removeable nest of smaller drawers (now missing). At the back of the box is a sliding cover to four full-depth plain oak dovetailed drawers lined with marbled paper, and fitted with modern thread pulls held with stuffing. 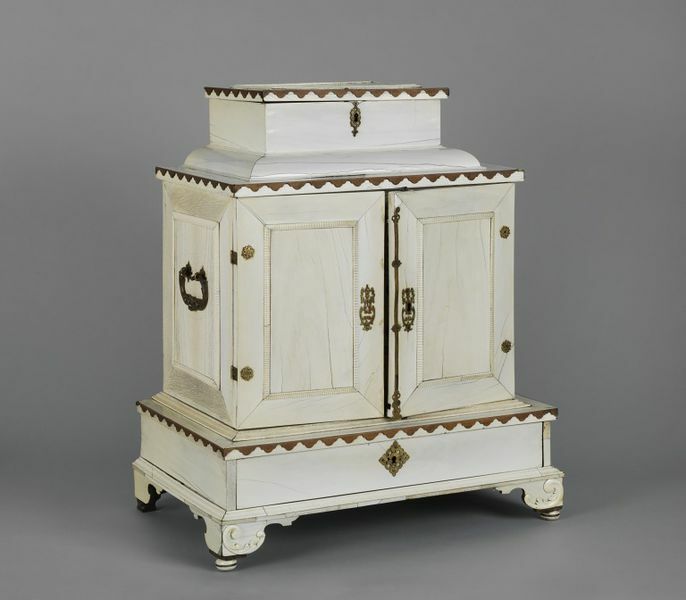 The base and top of the cabinet are veneered with lambrequins in ivory and walnut. The cabinet is set with a superstructure in the form of a box, with rounded base moulding, the hinged lid veneered with ivory and walnut in the manner of the base and top of the cabinet. The locks plates to both external drawers, to the two doors (only one with a keyhole) are of gilt-brass, as are the carrying handles on either side, decorative, the two hinges on the inside of each door and the circular plaques covering the screw attachments of the hinges on the outside of the doors, and a central band of metal covering the outer join of the two doors. The painted gilt-copper plaques are oval on each inner drawer, with arched panels in the central door and on the inside of each outer door, each arched panel with an oval panel set below in a plinth created by the applied ivory panels. The back of the cabinet is veneered with walnut, maple and kingwood, with a central star design on a light ground, framed with walnut veneer. Perseus rescuing Andromeda (inside the right door). The images (with the exception of Mercury and Herse, and Perseus delivering Andromeda) are taken from the engraved illustrations by Virgil Solis (1514-1562) in the popular translation of the 'Metamorphoses' by Johann Posthius (1537-1597), published in 1563 at Frankfurt-am-Main by G. Rabe, Sigosmund Fayerabent and Galli heirs. On the inside face of the drawer fronts, an irregular oval saw cut (starting at a drilled hole) has been made slightly larger than the painted plaque as viewed from the front. This object formed part of the collections of Alfred Williams Hearn, who acquired it in about 1871 from Wickham Flower of the Surrey Archaeological Society. He in turn acquired it from Frau Ehlers of Dresden the year before. Historical significance: Various public collections house a few ivory cabinets, made in Augsburg between about 1630 until 1655. Two similar items, in the National Museum of Bavaria in Munich, are known to have been made by Melchior Baumgartner in 1646 and 1655, respectively. Although the V & A's cabinet was neither signed nor dated, it was most likely made at about this time, and possibly by Melchior Baumgartner (1621 - 1686) or his father Ulrich (1580 - 1652), the leading cabinetmakers of Augsburg of their day. This cabinet was made from costly materials and most likely for a prince or nobleman, for whom collecting and the hours spent in contemplation of his collection would have been regarded as a princely and scholarly virtue since the 1570s if not earlier. Decorating the cabinet with myths copied from the illustrations of Johann Posthuis's translation of Ovid's Metamorphoses, published in Frankfurt in 1563, would no doubt have reinforced the image of the owner's erudition. This cabinet did not just serve to store the owner's collections but also to proclaim them to those he invited to admire them, whilst at the same time exalting the art of the Augsburg cabinetmaker, by then perhaps the most prestigeous woodworker in Europe. During the 16th and 17th centuries, collectors tended to divide their curiosities between the 'natural' ( naturalia ) and the 'artificial' (artificialia). Cabinets like this example were made in Augsburg, and veneered in ebony or (more rarely) in ivory and mounted with silver, enamel, lapis lazuli and other semi-precious stones. A number were commissioned by Philip Hainhofer (1578 - 1647), a collector and diplomat, and either purchased by princes and statesmen or presented to them as diplomatic gifts. These cabinets were fitted with large numbers of drawers, some ingeniously hidden, and often came furnished with collections already assembled, such the cabinet presented by the Councillors of Augsburg in 1632 to King Gustavus Adolphus of Sweden, which is currently housed in Uppsala University. Table cabinet veneered in ivory, with gilt copper plaques, painted with scenes from Ovid's 'Metamorphoses'; with key. Possibly made in the workshop of Ulrich and Melchior Baumgartner, Augsburg, ca. 1650. Georg Himmelheber, 'Ulrich und Melchior Baumgartner', Pantheon, Jg. 33 (1975, Heft 2, S. 113 - 120. Georg Himmelheber, 'Kabinettsschränke', Bayerisches Nationalmuseum Bildführer 4 (Munich, 1977), pp. 35 - 44. Oliver Impey and Arthur MacGregor (eds. ): The Origins of Museums - The Cabinet of Curiosities in Sixteenth- and Seventeenth-Century Eurpope. (Oxford, 1985), passim. Dieter Alfter: Die Geschichte des Augsburger Kabinettschranks , (Augsburg, 1986), pp. 80 - 84. Such cabinets are more commonly veneered with ebony and were regarded as most acceptable gifts among fashionable people of the time. The detailed embellishment varied greatly, mostly consisting of silver mounts. The present example is set with gilt copper plaques painted with mythological subjects. The Alfred Williams Hearn Gift. The paintings are taken from the illustrations of Virgil Solis (1515-62) for the popular translation of Ovid's Metamorphoses by Johann Posthius (1537-97) published in 1563 at Frankfurt, Germany. From left to right the painted plaques show Daedalus and Icarus, daphne being changed into a laurel, Apollo shooting Python, Aglauros raising the lid in which Erichthonius had been concealed by Minerva, Arcas shooting Callisto, Orpheus amid the wild beasts, Mercury and Herse, Cadmus and the Dragon, Apollo shooting Coronis, Phaeton asking permission to drive the horses of the sun, Actaeon being changed into a stag, and Perseus delivering Andromeda. Most of the paintings are taken from illustrations to the version of Johann Posthius (1537-97) of Ovid's Metamorphoses (Frankfurt, 1563) by Virgil Solis (1515-62), the leading German designer of ornament in the mid 16th century. 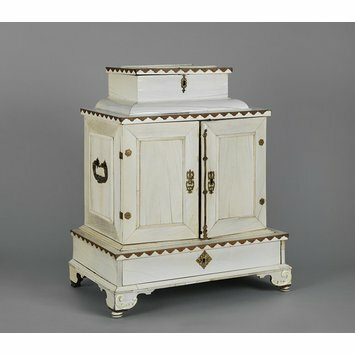 Ivory was rarely used as a veneer for cabinets, and may be seen as a luxurious contrast to the more usual ebony. A similar ivory cabinet, housed in the National Museum of Bavaria (Munich), is signed by Melchior Baumgartner (1621 - 1686) of Augsburg and dated 1646. Although no date or signature has been found on the V&A's example, this cabinet was very likely made in Augsburg and is highly likely to have come from the Baumgartner workshop. Another similar cabinet is in the collections at Skokloster, Sweden (this apparently with painting on the ivory surrounding the door plaques of painted gilt copper (see J. Knutsson, 'Cabinets at Skokloster', 1985, cat. no. 8). That cabinet is decorated with biblical subjects, also from engravings. An ivory cabinet of almost identical size and form (with oval panels of New Testament subjects) was sold at auction by Bruun Rasmussen, Copenhagen, 28 October 1997, lot 8. Another, also with New Testament subjects (but painted on ivory plaques) was with the dealer Georg Lane, Munich in 2008 and illustrated in the catalogue 'Möbel für die Kunstkammer europas', pp. 106-9.